Ok, after dinner last night (steaks – to which they asked, ‘how would you like it done?’) and a half hour massage (I asked my masseuse if I could sleep on the massage table all night. She said no), we had a somewhat fitful sleep. But the worst: waking to AC/DC being played full blast, followed by an onslaught of bubble gum pop music. I get it already, I’m awake. Now back the F*&! off! Grrr. I like my mellow morning. I don’t need a jack hammer to get me up and at em’! But, the day was fantastic: shorter at 93 kms, we finished just under five hours. It also felt so much better physically: jet lag is wearing off, legs are getting stronger, we’re finally adapting to the altitude. It was also a day of some incredible switchback descents with a wee bit of rock and a few technical sections. A few people had accidents, we later discovered. The most beautiful part was climbing to a plateau where the trail cut through the top, with the edge on either side about 40 meters away. Below was undulating golden farmland spotted with azure reservoirs from the irrigation dams. Today was also marked by meeting some amazing people, most notably Lance Stephenson from Daisyway Coaching Systems based near Cape Town. I noticed his dreamy blond pony tail; Paul was impressed with his bike handling skills. We chatted about technical skills and had a few laughs – then I gave him my card. He’s the kind of person you hope to meet again. Shortly before arriving at the first waterstation at 30 kms, Lance, a UCI Level 2 Coach, provided some riding tutelage: “ride up here,” he said pointing to his pedal. This shielded me from the cross wind, and as a result, I didn’t have to work as hard. Brilliant. Paul has also told me this numerous times, by the way. I don’t often listen very well, especially to him (Paul just added that); stubborn Mel. “Now, as we head down get into a bigger chain ring, bigger, bigger,” said Lance. Sure enough I was riding with the big boys! Sailing into the water station, it felt good. A group effort. A posse. Paul and I liked him right away. This is another reason to ride these races. Amazing people. We decided to keep the water breaks short today– it’s so much harder to get started if you stop too long. Paul grabbed the water; I peed in a bush. We stripped our leg and arm warmers – giving them to the race organizers who then labelled them with your tent number, to which you can retrieve at the end of the day. It’s all about the systems. Grabbing some taters with salt, washed down with some cold Coke, and we were off. 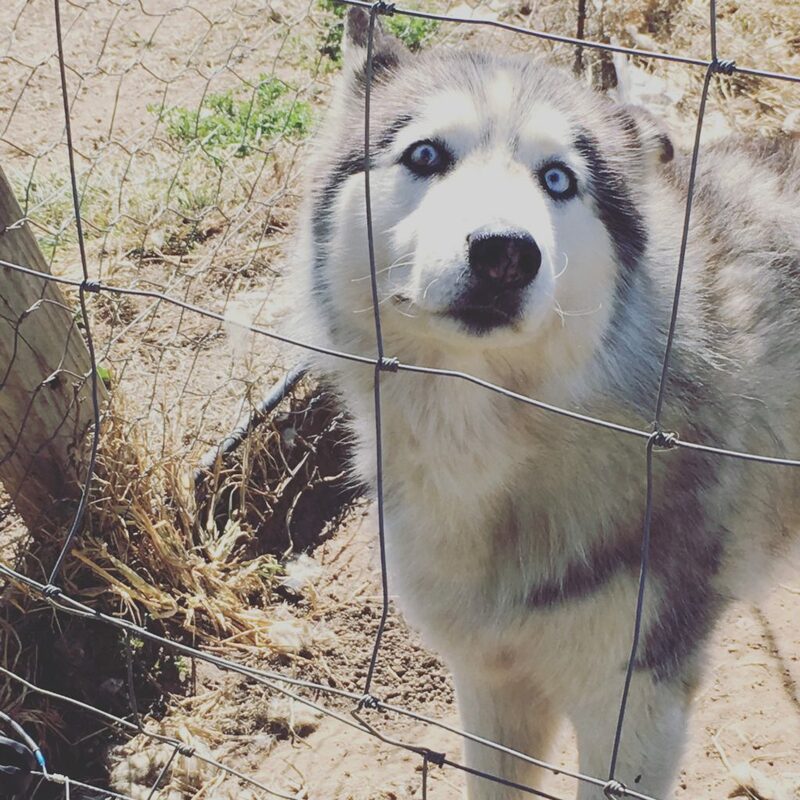 After a long slog, just a few kilometres before finishing, we came across a wolf sanctuary with huskies and yes, shaggy wolves. So beautiful. Other than the riding, here’s a little sample of the daily riding village, which the organizers must take down and recreate every day as we approach the southern coast. After the little girl took our bikes, we showered, went for a massage, then stretched in the stretching zone, a little outside studio with matts and rollers — even platforms to stretch your calves. We dropped off our Garmins for charging, then grabbed lunch (roast beef sandwiches and salads). Next, we proceeded to the bean bag chairs with a beer and tried desperately not to fall asleep. But since we got in at noon, we had the entire afternoon to rest. Our new friends hung out with us, too. Amazing day all round. Ok, must go before I eat my arm off. It’s dinner time. Em Gatland’s images on our Facebook album can be found here.